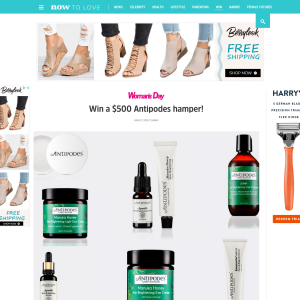 Antipodes is a scientifically validated organic beauty brand that creates and makes its premium natural skincare and makeup in New Zealand. We have a large selection of the iconic green beauty brand's products to give away valued at more than $500 to one lucky winner. The prize pack includes the new vegan Halo Skin-Brightening Facial Mud Mask, made with volcanic mud from New Zealand's geothermal central plateau, and its best-selling Manuka Honey Skin-Brightening Duo featuring world-famous New Zealand Manuka honey. Entry is open only to New Zealand residents. Employees of Bauer Media Group (LP) NZ, their affiliates, agencies and immediate families are ineligible to enter. No responsibility is taken for lost, misdirected or incomplete entries. Entries are limited to one per person. Open to New Zealand residents only. This promotion commences July 5, 2018 and ends 9am August 19, 2018. By registering their details, entrants give permission for Bauer Media Group (LP) NZ to post, email and mobile text message updates. The prize consists of an Antipodes prize pack. We have 1 to give away. The prize package must be taken as offered and is not exchangeable, transferable or redeemable for cash. Bauer Media Group (LP) NZ reserves the right to exchange any item with another item of greater value. Anything not specified in these terms and conditions as being included in the prize package is excluded. The winner will be contacted via email. The promoter is Bauer Media Group (LP) NZ, Shed 12, City Works Depot, 90 Wellesley Street West, Auckland.